This beautiful French Secretary with its Asian motif was severely damaged by water. 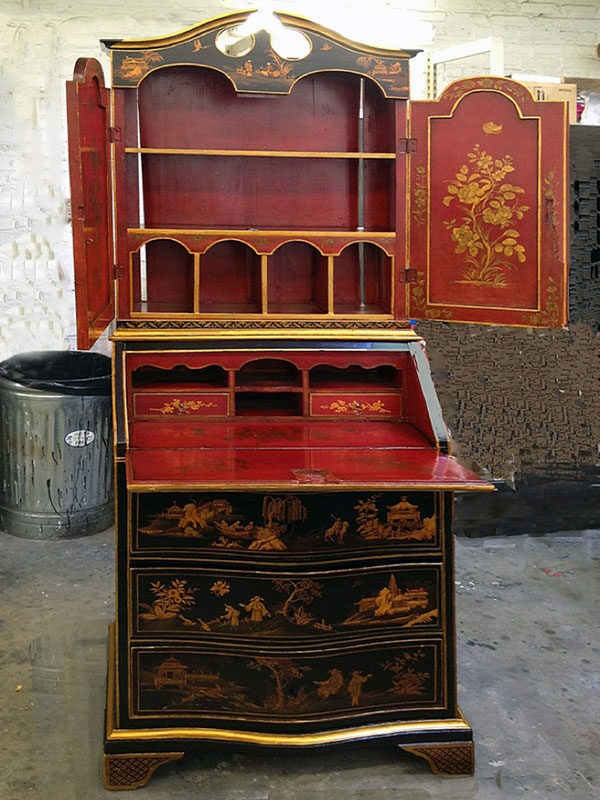 Our craftsmen restored the wood finish, captured the artistry of the images on this secretary and restored the delicate chinoiserie treatment given to the piece. Vintage 1850 Roll Top Desk restored to its previous look and functionality. Karzen's team restored this bar's exterior to show the quality original wood look. English Secretary, suffered heavy water damage in a basement. Karzen Restoration completely restored the rich wood finish and the original brass hardware used to accent the desk. Ready to restore your antique furniture? Let Alan Karzen and his antique restoration team bring your furniture back to life!